We don't all have £300+ to spend on a new big stick, so is it worth going second-hand? The average price of a driver in our Top Gear mega test was more than £311. For that kind of cash you get the latest technology, performance and the chance to get a proper fitting. Yet that's still out of reach for a lot of people. That's why so many golfers now buy second-hand clubs. With new product cycles running annually, there's never been more choice when it comes to used clubs – and there are some incredible deals to be found. For the test we teamed up with GolfBidder.co.uk to source the best range of stiff-shafted, 10.5° sub-£150 drivers. TG test pro Chris Ryan hit each on a SkyTrak launch monitor at The National Golf Academy at The Belfry. We then crunched the numbers to see how each club performed. 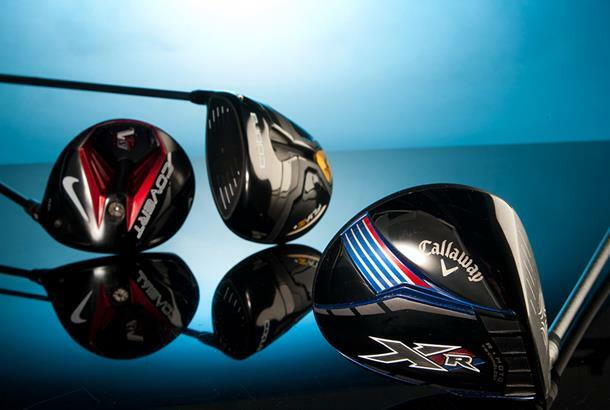 We also wanted to know how a £150 driver compares against one of 2016's leading drivers. An R-MOTO face and internal ‘standing wave’ aid face flex and energy transfer at impact to increase ball speeds. A Speed Step Crown reduces turbulent air flow for faster club speed. We say: The first Callaway driver to talk seriously about aerodynamics, and the role they play in increasing club speed and distance. Our XR may only have been a year old, but it was seriously in need of a re-grip; Chris felt he couldn’t go at drives full tilt as the grip was so slippery. The data shows XR didn’t quite manage to keep up with the very longest on test, which primarily could be put down to the lack of grip. The Project X is a very good shaft and thanks to the adjustable hosel you can switch these shafts into another Callaway driver head at a later date. Our verdict: When it comes to head shape and looks, along with a decent tech story, the XR is absolutely spot on. Even at its launch price it was a lot of driver for the money. It’s really playable, has a great mix of powerful sound, a reasonably deep face and an aerodynamic story for less than half of what it would have cost you last year. That’s a bit of a steal. The numbers: Ball speed 166mph, launch angle 10 degrees, backspin 2,390 RPM, carry distance 267 yards. Ping's first driver to have an adjustable hosel. At the time it was Ping's largest and most forgiving driver pro le ever. There's an ultra- thin crown with low and back CG to improve MOI and help maintain ball speeds across the face. We say: There's no doubting the G25 put in a really solid performance, even though it doesn't boast the 'turbulators' found in Ping's latest G driver. Chris thought the sound was much more solid than the ringing G30. The body is really wide from face to back which we didn't like quite as much as the new G, but it does look like there's plenty of loft on the face which many golfers will and really comforting. Looking at Chris's data the spin is spot on for long drives. An average of 271 yards is not to be sniffed at, but we reckon by raising that launch a little (through a shaft fitting and the adjustable hosel) there was even more juice to be squeezed out of the G25. Our verdict: A very good driver for the price. G25 is still capable of competing with the latest models. The condition was really good and Ping's reputation for holding value suggests a reasonable return on the driver in another year or two. The numbers: ball speed 167mph, launch angle 10.8 degrees, backspin 2,318 RPM, carry distance 271 yards. TaylorMade talked low, forward CG with the SLDR as they reckoned it improved ball speeds. The key message encouraged golfers to “loft up” to increase playability. A 20g sole sliding weight can be located in one of 21 positions for fade or draw bias. We say: Low and forward CG – and its ball speed benefits – was vastly different to what we’d been told before, and since. Chris reckoned that even if a low and forward CG is good for distance, lofting up is not quite the answer for forgiveness. Compare the SLDR’s data with our 2016 driver and we can see how tech has moved on. The new club’s lower spin – with a much deeper centre of gravity – creates a higher MOI; its ball speed drop-off was 2mph less than the SLDR’s. The extra forgiveness and playability of the 2016 club makes the SLDR’s tech a bit outdated. Our verdict: The SLDR is a previous TG Gold Award winning driver and brings great performance to the table. But if your game demands forgiveness it probably isn’t the answer. Unless you know the SLDR is a good match for your game we reckon there’s a better option out there. The numbers: ball speed 165mph, launch angle 11 degrees, backspin 2,415 RPM, carry distance 270 yards. Nike’s first cavity-back driver, which positioned weight in the toe and heel to enhance stability, forgiveness and maintain ball speed on off-centre hits. A NexCOR face produces faster ball speeds through a larger hitting area and FlyBeam technology stiffens the head to reduce energy loss at impact. We say: We don’t usually include ‘Tour” drivers in our tests as they’re not really aimed at the majority of golfers, and Covert’s 430cc head size is a case in point. But the standard Covert was not available. It didn’t stop Chris loving the Nike though, from the deep-faced head to the rounder, smaller pro le. An 8mph drop in ball speeds across the face showed how a Tour driver is less forgiving than a wider-headed model. Chris posted an average carry just one yard short of the 2016 club – impressive for three-year-old tech. Our verdict: Covert Tour is not built for most golfers, but if it’s suited to you for £83 it’s an absolute bargain. It was just about capable of keeping up with the 2016 club on test pro Chris’ best shots, but its drop off in ball speed was 5mph higher than the new driver... which highlights perfectly how punishing the club is on mishits. The numbers: ball speed 167mph, launch angle 12.4 degrees, backspin 2,307 RPM, carry distance 275 yards. A low, back CG weight maximises MOI and optimises launch angle for increased carry distance say Benross. There’s also a CT Response channel in the sole to improve ball speeds across the face and a Mitsubishi Kuro Kage Black shaft comes as standard. We say: The Benross was the only new driver in our test because it’s available for £129 straight out of the wrapper. Included in the price is a custom fitting session, another advantage of buying new. HTX posted distances right up there with the longest on test. But it also posted the highest average spin numbers too, which robbed it of extra yards. This extra spin can be attributed to the forged construction Benross use to get the HTX to market for £129. Every other driver in this test is cast and so more expensive to produce. Our verdict: Benross posted some really strong numbers against the very best drivers of the last couple of years. With the performance levels pretty similar, only you can you decide whether to plump for a branded driver which you’ll see in the hands of tour players or if you’re happy playing a new driver with less brand kudos. The numbers: ball speed 163mph, launch angle 11.9 degrees, backspin 2,859 RPM, carry distance 273 yards. Fly Z+ features ‘FlipZone’ weighting. Flipping the CG weight to the forward position creates a lower ball flight with more run-out while the back setting promotes height and carry. There’s also an eight-position hosel sleeve, a carbon crown and a speed channel running around the clubface to maximise ball speeds. We say: The original face sticker was still in place and the shaft label yet to be removed; it was basically as new, £207 less than 12 months ago. The carbon crown, speed channel face, adjustable hosel and smart pad technology are all similar to what you’ll find on the current Cobra F6+, just without the multi-position CG weight. The head sounded powerful even if the numbers weren’t quite as impressive as some. The ball flight with the CG weight forward was lower than the others, useful if you play a lot in windy conditions, or on hard links fairways or just want to lower spin. Our verdict: Yes, the distance is behind some. But we know the Z’s a decent performer through previous testing. A proper fit would do the trick, though that adds expense. Overall, though, this Fly Z is a lovely driver in A1 condition. The numbers: ball speed 165mph, launch angle 10.1 degrees, backspin 2,323 RPM, carry distance 265 yards. SpeedGolf: A hole in run!